Authors are invited to submit papers by February 14th, 2016 (short papers 4-6 pages, full papers 8 -10 pages) and posters by March 15th, 2016. Accepted papers will be published in the SIGBED Review newsletter (indexed also in DBLP and Scopus). By submitting to the workshop the authors are granting permission for ACM to publish in print and digital formats for the newsletter and the ACM archive. Note that the copyright remains with authors. Zhihao Jiang, Houssam Abbas, Pieter Mosterman and Rahul Mangharam. Chung-Ling Lin, Wuwei Shen and Richard Hawkins. Sriram Sankaranarayanan, Suhas Akshar Kumar, Faye Cameron, B Wayne Bequette, Georgios Fainekos and David Maahs. Liang Cheng, Zhangtan Li, Yi Zhang, Yang Zhang and Insup Lee. Paloma Rubio-Conde, Diego Villarán-Molina and Marisol García-Valls. Nicola Paoletti, Patanè Andrea and Marta Kwiatkowska. Alena Simalatsar, Monia Guidi and Thierry Buclin. Ubiquitous connectivity of consumer and industrial equipment has laid the foundation for the Internet of Things (IoT) with projections of 50 billion devices connected and the addition of $15 trillion to the global GDP within 15 years. Applied to healthcare, the Medical IoT (MIoT) may enable revolutionary improvements in the quality and safety of healthcare, unleash innovation, and reduce the cost of healthcare delivery. To meet this vision, safety, security, and interoperability must be baked into the foundation of the MIoT. Short Bio: Julian M. Goldman, MD is Medical Director of Biomedical Engineering for Partners HealthCare System, an anesthesiologist at the Massachusetts General Hospital, and Director of the Program on Medical Device Interoperability based at MGH, Partners, and CIMIT. Dr. Goldman founded the federally funded Medical Device "Plug-and-Play" (MD PnP) Interoperability research program in 2004 to promote innovation in patient safety and clinical care by leading the adoption of patient-centric integrated clinical environments. The MD PnP team has been recognized by multiple awards, including the Edward M Kennedy award for Healthcare Innovation. Dr. Goldman is Board Certified in Anesthesiology and Clinical Informatics. He completed anesthesiology residency and research fellowship in medical device informatics at the University of Colorado. He departed Colorado as a tenured associate professor to work as an executive of a medical device company. Subsequently, Dr. Goldman joined Harvard Medical School and the Department of Anesthesia, Critical Care, and Pain Medicine at MGH in 2002 as a staff anesthesiologist, where he served as a principle anesthesiologist in the MGH "Operating Room of the Future". Dr. Goldman co-chaired the FCC mHealth Task Force, the HIT Policy Committee FDASIA Workgroup regulatory subgroup, and the FCC Consumer Advisory Committee healthcare working group. He served on the NSF CISE Advisory Committee, as a Visiting Scholar in the FDA Medical Device Fellowship Program, and as a member of the CDC BSC for the NCPHI. Dr. Goldman currently serves in leadership positions in several medical device standardization organizations including Chair of ISO Technical Committee 121, Chair of the Use Case Working Group of the Continua Health Alliance, Co-Chair of the AAMI Interoperability Working Group, and Chair of ASTM Committee F29. Dr. Goldman is the recipient of the International Council on Systems Engineering 2010 Pioneer Award, American College of Clinical Engineering (ACCE) award for Professional Achievement in Technology, the AAMI Foundation/Institute for Technology in Health Care Clinical Application Award, and the University of Colorado Chancellor's "Bridge to the Future" award.. The talk will move from capsule robots for gastrointestinal endoscopy toward a new generation of surgical robots and devices, having a relevant reduction in invasiveness as the main driver for innovation. Wireless capsule endoscopy has already been extremely helpful for the diagnosis of diseases in the small intestine. Specific wireless capsule endoscopes have been proposed for colon inspection, but have never reached the diagnostic accuracy of standard colonoscopy. In the first part of the talk, we will discuss enabling technologies that have the potential to transform colonoscopy and gastroscopy. These technologies include magnetic manipulation of capsule endoscopes, water jet propulsion, real-time pose tracking, and intermagnetic force measurement. The second part of the talk will give an overview about the development of novel robotic solutions for single incision robotic surgery. In particular, a novel surgical robotic platform based on local magnetic actuation will be presented as a possible approach to further minimize access trauma. The final part of the talk will introduce an open-source component-based design environment for capsule robots that aims at facilitating researchers in the field in exploring novel concepts and reducing the time to achieve a functional prototype. 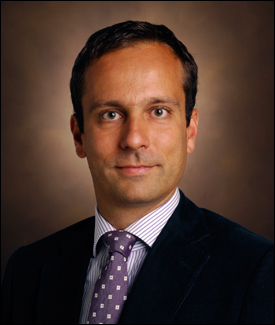 Short Bio: Dr. Valdastri is currently Assistant Professor of Mechanical Engineering, with secondary appointments in the Electrical Engineering Department and in the Division of Gastroenterology, Hepatology and Nutrition at Vanderbilt University Medical Center. He is the founder and director of the Science and Technologies Of Robotics in Medicine (STORM) Lab, a standing member of the Vanderbilt Institutional Review Board, a Senior Member of IEEE, one of the Editors of IEEE ICRA from 2016 to 2018, and Associate Editor of the Journal of Medical Robotics Research. His current research – focusing on capsule robots for gastrointestinal endoscopy and abdominal surgery – is funded by the National Science Foundation, the Broad Foundation, and the National Institute of Health. Dr. Valdastri is co-author of more than 70 peer-reviewed journal publications, co-inventor of more than 30 patents and patent applications, co-founder of a successful medical start-up (WinMedical, www.winmedical.com), and the recipient of several prestigious awards in the field of medical robotics, including the NSF CAREER Award in 2015, the Sensys 2014 Best Paper Award, the OLYMPUS Best Laparoscopy/Robotic Paper Award 2013, the OLYMPUS ISCAS Best Paper Award 2012, the ASME Design of Medical Devices Conference Best Paper Award 2012, the Hamlyn Symposium on Medical Robotics Best Oral Presentation Award 2011, and the European Association of Endoscopic Surgery Best Technology Presentation Award 2011. The CyberCardia project is part of the NSF’s initiative to advance the state-of-the-art in Cyber-Physical Systems (CPS): engineered systems that are built from, and depend upon, the seamless integration of computation and physical components. The goal of this project is to develop far more realistic cardiac device models and controllers than the ones that currently exist. The CyberCardia platform will provide a basis to test and validate medical devices faster and at a far lower cost than existing methods. It will also provide a platform for designing optimal, patient-specific device therapies, thereby lowering the risk to the patient. CyberCardia includes collaborators from seven leading universities a nd centers CMU, RIT, UM, GTech, UPenn, FC-ESE, SBU, TUW and FDA. Short Bio: Rahul Mangharam is an Associate Professor in the Dept. of Electrical & Systems Engineering and Dept. of Computer & Information Science at the University of Pennsylvania. He directs mLAB: Real-Time and Embedded Systems Lab and xLAB: Experience Design and Technology Lab at Penn. His interests are in real-time scheduling algorithms for networked embedded systems with applications in medical devices, energy efficient buildings, automotive systems and industrial wireless control networks. He received his Ph.D. in Electrical & Computer Engineering from Carnegie Mellon University where he also received his MS and BS in 2007, 2002 and 2000 respectively. He has worked on ASIC chip design at FORE Systems (1999) and Gigabit Ethernet at Apple Computer Inc. (2000). In 2002, he was a member of technical staff in the Ultra-Wide Band Wireless Group at Intel Labs. He was an international scholar in the Wireless Systems Group at IMEC, Belgium in 2003. Rahul received the 2014 IEEE Benjamin Franklin Key Award from the IEEE Philadelphia Section, 2013 NSF CAREER Award, 2012 Intel Early Faculty Career Award and was selected by the National Academy of Engineering for the 2012 US Frontiers of Engineering. He was the Stephen J. Angelo Term Chair Assistant Professor at the University of Pennsylvania from 2008-2013.